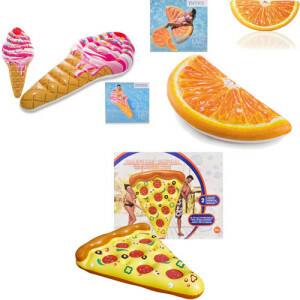 Brand new for the Summer season we have added a fantastic collection of Food inspired inflatables. There is a cool selection available including, Pizza, Orange Slice and Ice cream. Each inflatable is of substantial size, meaning 1 person can comfortably lounge across it, or in the case of the Pizza Slice, 2 people can fit on. They are suitable for many different uses such as; lounging around the house or sun bathing in the garden on hot days. But most of all they are just perfect to float around the pool on making you the coolest in the swimming pool. All of wholesale inflatables are manufactured by the renowned brand Intex. They come compact and neatly packed in a display box. Each box comes with the full image displayed across the box making it a great point of sale. Available at a super trade price from A&K Hosiery and ready for fast despatch. This entry was posted on Thursday, March 29th, 2018 at 3:10 pm	and is filed under New Products & Specials, Wholesale Inflatables, Wholesale Toys. You can follow any responses to this entry through the RSS 2.0 feed. Responses are currently closed, but you can trackback from your own site.